Connecticut outperforms most states in addressing elder long-term care, but needs to improve support for family caregivers, transitions between hospitals and other settings and affordability of nursing homes, according to a national report card. The state ranks 12th overall among all 50 states and the District of Columbia in meeting 26 indicators across five key dimensions of care. It scored high in offering choice of setting and provider, quality of life and quality of care. And while it ranks high for access to care, it needs to substantially improve affordability. The state fares poorly in care transitions (39th) – the process of shifting care from one setting to another ­– and in support for family caregivers (30th). While the overall trend is positive compared with the first scorecard in 2011, “there’s a lot of work we need to do around supporting family caregivers and making the transitions process much more effective between hospitals, nursing homes, and community-based settings,” said Claudio Gualtieri, advocacy director for AARP Connecticut. Minnesota ranked highest across all dimensions, while Kentucky was 51st across the five benchmarks. Rhode Island was 38th overall and Massachusetts was 18th, according to the 2014 State Scorecard on Long-Term Services and Supports for Older Adults and People with Physical Disabilities. The AARP Public Policy Institute, The Commonwealth Fund and the SCAN Foundation collaborated on the research. Affordability of long-term care services — especially for the middle class, who don’t qualify for Medicaid — remains a huge obstacle. The cost of nursing homes is well beyond what an average consumer can afford according to the new ratings. The median annual private pay cost for a nursing home as a percentage of median household income for those age 65 and older was a whopping 359 percent in Connecticut. In comparison, the national median rate is 234 percent and in the state with the lowest rate, Oklahoma, it’s 168 percent of median income. Home care services cost approximately 77 percent of median household income for older adults in Connecticut, less than the all-states median rate of 84 percent. Long-term care insurance has not filled the gap, Gualtieri said. Among residents age 40 and older, only 5.3 percent actually have policies. Market instability, resulting in sudden spikes in premiums and changes in coverage make many wary of investing in such a policy. “We’re seeing more people rely on Medicaid and safety net programs at a time when state budgets are also contracting,” Gualtieri said. Since most people want to grow older at home, family caregivers carry much of the burden. Gualtieri estimates that they provide $5.6 billion annually in unpaid care in Connecticut. “These folks are the unsung heroes of our long-term care system and we need to find a way to support them or they’re going to burn out,” said Julia Evans Starr, director of the Connecticut Legislative Commission on Aging. Family caregiving has changed into a much more intense, medically-oriented role, Gualtieri said. Caregivers interviewed for this year’s scorecard agreed that one of their biggest challenges is understanding the type of medical tasks they’ll be called on to do when their loved one is back in the community. There is also an overwhelming desire for help in navigating the medical system. 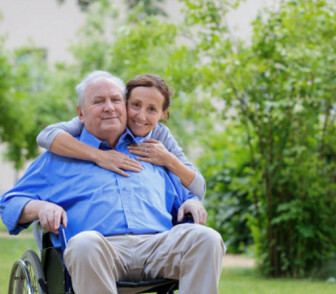 Caregiving is traditionally managing household tasks, such as grocery shopping, meal preparation, and overseeing the checkbook. “That still all happens but layered on top of that, the modern caregiver is also doing a lot more therapy, medication administration, care coordination of multiple medical appointments for their loved ones,” he said. That can quickly lead to feelings of being overwhelmed and burnout, particularly if caregivers are also juggling work or raising their own families. Several efforts are underway to make care transitions more effective and less costly. Connecticut is one of 29 states, plus the District of Columbia, participating in the Money Follows the Person initiative — a federal demonstration program that helps states “rebalance” their long-term care support systems and provides incentives to move some older or disabled adults out of nursing homes and back into the home. Under the program, the state receives enhanced Medicaid reimbursement of approximately 80 percent rather than the normal 50 percent, according to an analysis by the Connecticut General Assembly. There is more flexibility to provide supplemental services that Medicaid would not normally cover. The cost-savings are reinvested into community based services and programs. Recently approved protocols within the Money Follows the Person program will offer family caregivers training and respite opportunities. “Caregivers will get training around certain medical tasks or get some relief to get their own life in order,” said Gualtieri. The Commission on Aging helped to create the website, myplacect.org, a one-stop information and resource portal for various long-term care programs and supports for consumers, caregivers and job-seekers. The site will get visitors to the local or state service that can provide help. The system is closely tied into 211 and is updated regularly. Gualtieri and Starr agree that Connecticut residents must better prepare for long-term care needs through an array of options. The commission’s “livable communities” initiative pulls together agencies responsible for transportation and housing, planning and zoning to help localities gain more insight into their populations and help them prepare their communities as residents age. A program called Decide/Create/Share uses trained community volunteers to reach out to baby boomers, particularly boomer-age women – to discuss financial planning, health care decisions, setting up powers of attorney and get them thinking about their future needs. “In 12 years, the leading edge of the boomers will be 80. They’re a third of our population in Connecticut, so even if you don’t care about these aging issues, you need to because it’s gong to impact all facets of society,” Starr said.